If you need a nice ride in the beautiful city Guilin, just simply contact us now to get our BEST QUOTES and GREATEST SERVICES today! Car rental serivice provider in Guilin city China ! We drive your way in Guilin! Guilin situated in the northeast of the Guangxi Zhuang Autonomous Region on the west bank of the Li River. Covers an area of 27,809 square kilometres ,Its name means "forest of Sweet Osmanthus", owing to the large number of fragrant Sweet Osmanthus trees planted in the city. Guilin has a monsoon-influenced humid subtropical climate, with mild winters and long, hot, and humid summers. The monsoon is long, lasting from March to August, Snowfall is rare but possible in the winter. Guilin is considered to be the pearl of China's thriving tourist due to its splendid natural beauty and historic treasures. It is well know that “ Guilin’s scenery is the best among all others”.Guilin has some of the most spectacular karst scenery in the world. Some of minorities inhabit the mountainous regions, including Zhuang (China’s largest minority), Yao, Miao and Dong peoples. Yangshuo has become a popular tourist destination for both Chinese and foreign visitors. At Longsheng one will marvel at Chinese agricultural ingenuity in the spectacle of the terrain fields. In Guilin you will find many famous attractions such as Liusanjie Landscape garden,Seven-star cave ,Elephant Hill, Reed Flute Cave, Two rivers and Four lakes, Li river etc. Tourism plays a primary role in Guilin’s economy, meanwhile ,local industry covers : pharmaceutical goods, tires, machinery, fertilizer, silk, perfume, wine, tea, cinnamon, herbal medicine etc. Shanghai Car Rental Service will be very honored to have the opportunity to serve you in Guilin city with our great limousine services, we will insure a hassle-free, most comfortable trip no matter you are traveling Guilin city for official business visits or personal tourists. All our drivers are from local and they are all licensed, well trained and with more than 6 years’ experience in serving our foreign customers, they are also quite familiar with the routes in Guilin and other cities in Guangxi province ,can easily drive you wherever you want. ◆Guilin City airport transfer services ,hotel pick up and drop off . ◆Guilin City railway /bus station/ transfer services . ◆ Guilin Daily Limousine or car rental services (chauffer services) for short term period, include Guilin Business tours or factory visits to neighborhood cities in Liuzhou, wuzhou and other cities in Guangxi province . 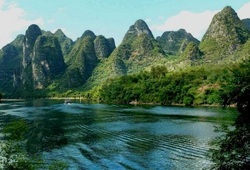 City tour sedan /mini van/mini bus/coach services for individual or group travelers to the famous Liriver , Yangshuo etc.